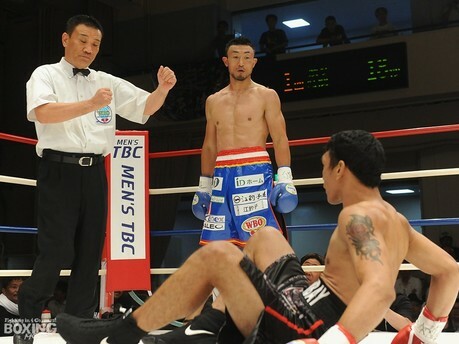 Earlier this year we saw Japan’s Keita Obara (20-3-1, 18) [小原 佳太] suffer a major upset defeat at the hands of Alvin Lagumbay (10-3, 9) in a bout for the WBO Asia Pacific Welterweight title. That bout ended in stunning fashion, with both men being dropped simultaneously, and ended up with Lagumbay recovering to his feet ready to fight whilst Obara couldn’t clear the cobwebs in time. Last night the two men had a rematch, and this time Obara got the upper hand and gained some revenge over the Filipino puncher. Obara had stated at the weigh in that he was going out with the intention of stopping Lagumbay and that showed from the opening moments as he looked sharp and on point. The power of Obara saw him drop the Filipino in the opening round to secure a 10-8 start to the fight. Obara would also shine in round 2, as he managed to avoid the power of Lagumbay and avoid a repeat of last time, when he was stopped in round 2, whilst landing hard counters on the back foot. The following round it was Obara’s power again that told as he hurt Lagumbay and forced the referee to jump in and save the Filipino. With the win Obara claims the regional title and gets some revenge over Lagumbay, and seemed relieved to have won. Sadly for Lagumbay this ends his short reign as a regional champion.